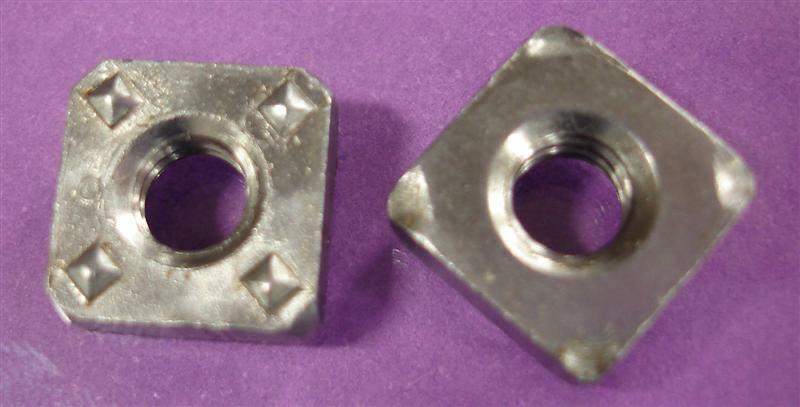 This Projection Weld Nut has a square shape and is well suited for use in through-hole applications. It features a precision pilot that facilitates quick and accurate loading into its designated sheet-hole location. This weld nut features four precision weld projections that enhance the strength and uniformity of the final weld. These industrial fasteners are offered by JHP Fasteners in a wide assortment of dimensions and thread sizes (inch and metric). Note: A variety of widths and thicknesses also available. The Square Projection Weld Nut is counter-sunk on both sides to enable quick and accurate engagement of the mating component onto the weld nut threads. This weld nut has rounded corners and can therefore be used within confined spaces. A strong uniform weld is ensured via the nut’s unique incorporation of four precision weld projections. This Square Projection Weld Nut is extremely versatile and will provide a robust spot weld connection in a wide range of applications and conditions. This weld nut is easy to use and works well in a wide range of production environments. JHP Fasteners offers expert consultation on the use of these types of industrial fasteners. Our 40 years of active industry experience allows us to provide you with a full range of services. We provide all of our customers with competitive pricing, reliable delivery times, and an efficient shopping/buying experience.